Posted in Lama Zopa Rinpoche News, SJFF News. 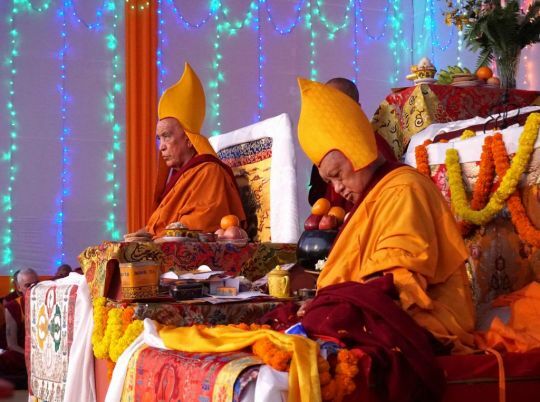 Jangtse Chöje Rinpoche and Lama Zopa Rinpoche during the long life puja offered to Lama Zopa Rinpoche in Bodhgaya on January 2, 2017. Photo by Ven. Lobsang Sherab. A long life puja was offered to Lama Zopa Rinpoche on behalf of Sera Je Monastery on the Maitreya Project land in Bodhgaya on January 2, 2017. The puja was to thank Rinpoche for twenty-six years of support offered through the Sera Je Food Fund, which provides three vegetarian meals every day to the monks studying at Sera Je Monastery. 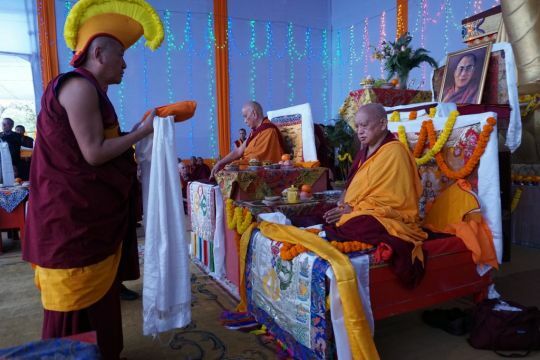 During the puja, the head of monastic discipline, who had been at Sera Je Monastery since before the Sera Je Food Fund was established, spontaneously praised Rinpoche for about thirty minutes, noting all the ways Rinpoche had helped the monastery. He explained what it was like at the monastery before food was regularly offered and how the monks have benefited after the fund’s creation. He said Rinpoche has cared for all the thousands of monks for the last twenty-six years like a mother does for her child. 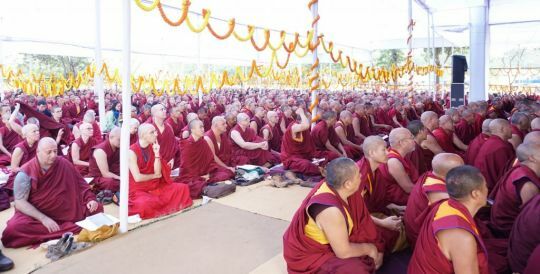 Thousands of monks attended the puja as well as Jangtse Chöje; the new abbot of Sera Je Monastery; the past abbot of Sera Je Monastery; the past abbot of Namgyal Monastery, Jhado Rinpoche; and the past abbot of Gyurme Monastery, Khensur Geshe Tashi Tsering. The Sera Je Food Fund has provided millions of meals since 1991. It currently offers approximately 700,000 meals per year, 2,900 meals per day. There are, on average, 1,600 monks benefiting from the food fund. Please rejoice in the offering of this puja for Lama Zopa Rinpoche’s long life and in Sera Je Food Fund’s twenty-six years of food offerings to the monks of Sera Je Monastery. You can learn more about the Sera Je Food Fund, read an overview of the food offered daily, or support this project with a donation of any amount. Approximately 1,600 monks benefit from the Sere Je Food Fund every year. As 2016 comes to a close, we’d like to invite you to rejoice in another year of offering food to all of the monks studying at Sera Je Monastery through the Sera Je Food Fund. Since 1991 the Sera Je Food Fund has offered millions of meals. We currently offer approximately 700,000 meals per year, 2,900 meals per day. In the Tibetan tradition, it is customary for monastics to support themselves. In addition to providing for their own housing, individual monks are responsible for purchasing and preparing all of their meals. As many of the monks are refugees from Tibet or from refugee families living in India, they have very little money for quality food and, consequently, were often malnourished and ill. Before the Sera Je Food Fund, most monks at the monastery never had adequate nutrition. Now, for the first time, they are well-nourished, and this makes a dramatic difference in the energy they are able to devote to their studies. Additionally, group preparation of meals and use of a communal kitchen allows more time for the monks to apply themselves to their studies without the added worry of cleaning up and preparing individual meals, monitoring their individual health for adequate protein and nutrition, etc. Monks of Sera Je Monastery enjoying a meal provided by the Sera Je Food Fund. Photo by Losan Piatti. Please rejoice in this incredible service which has been offered since 1991. On behalf of Lama Zopa Rinpoche, FPMT International Office would like to offer our heartfelt gratitude to all of the kind benefactors who have been contributing to this project over the years and supporting Lama Zopa Rinpoche’s Vast Vision. You can learn more about the Sera Je Food Fund or support this project with a donation of any amount. Posted in Ordained Sangha, SJFF News. Teenage Tenzin Ösel Hita with the monks at Sera Je Monastery. We’d like to invite you to rejoice in twenty-five years of the Sera Je Food Fund offerings meals to the monks of Sera Je Monstery! The Sera Je Food Fund began in 1991 when Tenzin Ösel Hita, the recognized incarnation of Lama Yeshe, entered Sera Je Monastery in southern India at age six. It is customary for a monk’s sponsor to make offerings to all Sangha on the day of officially entering the monastery and Lama Zopa Rinpoche wanted the offering to be of the greatest practical benefit to the monastery itself. After discussion with the abbot of Sera Je Monastery, it was determined that the most beneficial offering would be to create a food fund whereby all of the monks at Sera Je Monastery could be offered quality meals for free. In this way, Lama Zopa Rinpoche was not simply offering lunch on the day of Ösel’s entrance to the monastery but, without precedent, taking on the responsibility of providing meals to every monk at Sera Je for the rest of their lives. Initially, the fund offered money to each monk for lunch. At that time there were 1,300 monks and the annual cost was about US$25,000. It became apparent that it would be much easier for the monks to have the meals cooked and offered, so in 1997, Lama Zopa Rinpoche offered US$25,000 for a new kitchen and began paying the salary of seven fulltime cooks. At that time there were 1,900 monks and the annual cost was about US$175,000. In 1997, six years after starting the fund, Lama Zopa Rinpoche visited Sera Je Monastery. At that time, many of the older geshes, some with tears in their eyes, thanked Rinpoche and spoke of how the fund was benefiting the monastery. Monks could now attend all the morning debate sessions instead of taking time out to prepare meals. Additionally, the fund alleviated the great burden teachers carried while providing for students who had no resources. In 1998, Lama Zopa Rinpoche and the Sera Je Food Fund took on the responsibility of offering dinner to each monk. Sera Je monks help prepare meals for in the Sera Je Food Fund kitchen. In 2003, in addition to offering lunch and dinner, breakfast began to be sponsored by the Sera Je Food Fund three months a year. In 2008, Lama Zopa Rinpoche and the Sera Je Food Fund took on the responsibility to offer three meals a day to all monks of Sera Je. Osel Labrang took over management on the ground, ensuring the quality of the food and managing all aspects of buying and preparing the food. In 2012, In addition to offering all the meals to all the monks at Sera Je Monastery the Sera Je Food Fund also took on the responsibility to offer breakfast to the young monks who attend the Sera Je school. This has been the practice of the fund since 2012. 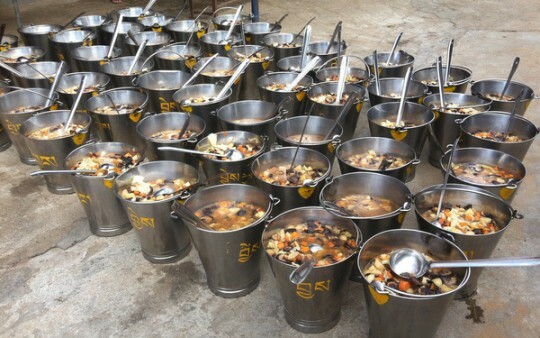 Healthy and hearty vegetarian soup is often offered, through the Sera Je Food Fund, as dinner to the monks of Sera Je Monastery. There are, on average, 1,600 monks benefiting from the food fund and the annual cost is US$200,000. In the Tibetan tradition, it is customary for monastics to support themselves. In addition to providing for their own housing, individual monks are responsible for purchasing and preparing all of their meals. As many of the monks are refugees from Tibet or from refugee families living in India, they have very little money for quality food and, consequently, were often malnourished and ill. Before the Sera Je Food Fund, most monks at the monastery never had a full stomach. Now, for the first time, they are well-nourished, and this makes a dramatic difference in the energy they are able to devote to their studies. Additionally, group preparation of meals and use of a communal kitchen allows more time for the monks to apply themselves to their studies without the added worry of cleaning up and preparing individual meals, monitoring their individual health for adequate protein and nutrition, etc. 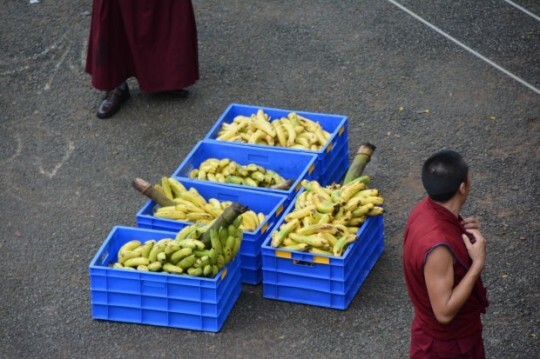 Over 22,000 bananas are offered in a typical month to the monks of Sera Je Food Fund. In one month, nearly 22,000 bananas, 120 bottles of soy sauce, and an incredible 5,500 pounds of flour, among many other ingredients including vegetables, rice, noodles, and tea, are utilized in preparation for this offering of daily vegetarian meals. Please rejoice in this incredible service which has been offered without interruption for twenty-five years and will continue far into the future. All are welcome to participate in this offering by donating to the fund. Since 1991, the Sera Je Food Fund has been offering three meals a day to every monk studying at Sera Je Monastery. Some monks do not need to rely on this service due to various reasons such as having personal benefactors who sponsor their food directly, but the food offering is available to every single monk who would like to receive it. Three meals are offered every day to any monk studying at Sera Je Monastery. Recently, Lama Zopa Rinpoche, FPMT CEO Ven. Roger Kunsang, and Charitable Projects Coordinator Ven. Holly Ansett spent a month at Sera Je Monastery with the Sera Je Food Fund team and attended a number of meetings with Ven. Ngawang Sangye who has been working for the food fund since 2007 while completing his geshe studies degree in 2016. He does an incredible job helping to manage this massive operation with the help of Vens Kalden and Rabten. They work with FPMT International Office on budget and cost analysis, which can become quite complicated when shopping and cooking for up to 2,500. In these recent meeting, the team discussed improvements that could be made to the program, advice and recommendations from a dietitian who was consulted last year, how to utilize seasonal produce, and the general food preferences of the monks. Recently, the entire menu was redesigned based on feedback from the monks and discussion with the kitchen management. 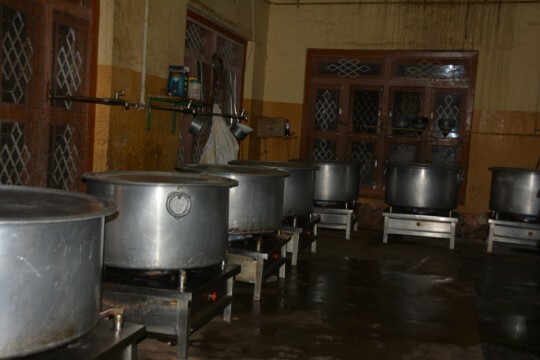 The food fund will continually assess and make adjustments and improvements to operations, procedures, and services offered to help ensure that this project is bringing the most benefit to those it serves.The Sera Je Food Fund not only covers the cost of all food, it is also responsible for the entire kitchen operation, paying cooks, utilities, and equipment upkeep. 8,700 pounds of flour and 6,500 pounds of rice are offered every month through the Sera Je Food Fund Kitchen. Every day each khangtsen (monastic house made up of monks from the same regions) informs the Sera Je Food Fund Kitchen how many monks will be joining for meals so the cooks can always prepare the right amount of food. There is almost no waste from the kitchen because any leftovers are offered to monks who engage in evening debate or classes allowing the monks to enjoy a second dinner if they are studying or debating late. Any food bought by the kitchen that is not used is sold back to the market making the waste for the kitchen extremely low. This is quite impressive when considering the volume of food being prepared and cooked. An incredible 8,700 pounds of flour and 6,500 pounds of rice are used every month in addition to large quantities of other foods such as vegetables, fruits, spices, grains, tea, milk, and other ingredients. Typically, about 50 monks are assigned to kitchen duties every day. They help ensure that the ingredients are top quality, that the kitchen is always hygienic and efficient, and that the food is tasty for the monks. Lunch is often eaten as a group in the Sera Je gompa when there are pujas or practices happening. The monks gather in the gompa for lunch when there are prayers and pujas organized around lunch time. Twenty-five years ago Lama Zopa Rinpoche initiated the Sera Je Food Fund as a way to offer daily benefit to all of the monks studying at Sera Je, enabling them to focus on their studies without having to worry about meals or the burden of food expenses and preparation. Since that time Ven. Roger has worked with support from Ven. Holly to help actualize this vision through continual work with the monastery and the benefactors who make this fund possible. Please take some time to rejoice in this incredible daily offering and the kindness of all the extremely generous donors who contribute to the success of this program. From the prep cooks, to the dishwashers, to those who do the shopping, to those who help manage the operation, to the accountants, to the food vendors, the Sera Je Food Fund is a massive collective effort on the part of many. You are welcome to join in on this offering by donating any amount, or by following the news and updates of this beneficial daily offering of food to hundreds of monks. 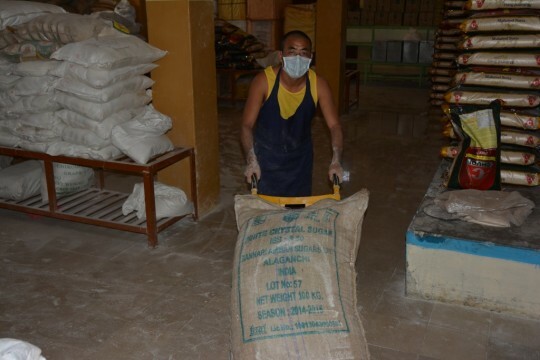 A monk from the Sera Je Food Fund Kitchen helps with flour needed for bread for 30,000. Over 30,000 people, including monks from surrounding monasteries, packed into Tashi Lhunpo Monastery for the last of His Holiness the Dalai Lama’s Jangchup Lamrim teachings in South India in late December 2015. The Sera Je Food Fund Kitchen prepared rice and bread to accompany the lunch offered by the teaching event, for every single participant. 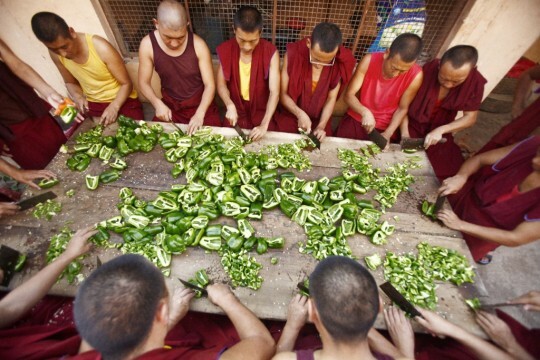 To accomplish this astounding offering, 150 monks woke up at 2 a.m. at Sera Je Monastry every morning to begin cooking. They then had to transport all of the bread and rice for 5.5 miles to Tashi Lhunpo Monastery in a sanitary way, every single day. Remarkably, they managed to serve the bread and rice steaming hot at lunch time. It is almost inconceivable to consider how they did this! Volunteer monks help kneed the dough required for massive amounts of bread. All of the bread had to be cooked on the grill before transporting it to Tashi Lhunpo Monastery. 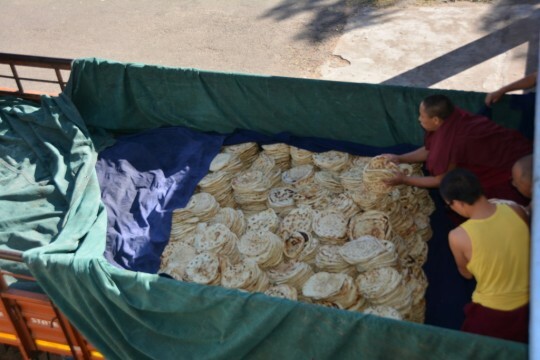 Bread for 30,000 getting carefully packed for transport to Tashi Lhunpo Monastery. The bread is carefully packed and ready to be transported. Giant pots were needed to prepare so much rice. The rice is carefully loaded into a truck for transport. This is just one way the Sera Je Food Fund Kitchen is utilized as a way to benefit ordained Sangha and students of His Holiness the Dalai Lama. Huge thanks to all of the monks who volunteer their time to make this possible, and to Ngawang Sangye and the Sera Je Food Fund team who made this offering of time and effort so joyfully, as evidenced by the photos above. Please rejoice in this tremendous effort! Since its inception in 1991, the Sera Je Food Fund has strived to assess and make adjustments and improvements to operations, procedures, and services offered to help ensure that this project is bringing the most benefit to those it serves. In 2015, two major changes were implemented which will not only benefit the monks as they partake in their daily meals, but also will benefit those who work very hard in the kitchen to get three vegetarian meals out every single day to all of the 2,500 monks. in March of 2015 a dietitian visited the monastery and gave suggestions on how to improve the monks’ nutrition through the food offered. Changes include: an increase in protein, an increase in the amount and variety of vegetables and seasonal fruit, less oil and salt, wheat has been introduced to the white flour used in breads (most prefer the white flour so this is a gradual transition), more variety of healthful dishes are now being offered as well. The dietician also spoke to all the monks regarding healthy food and diet. 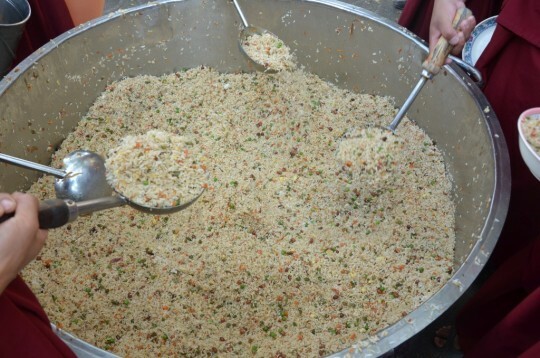 The monks have to work very hard with big equipment and huge quantities of food to help offer three meals every day. In October of 2015 a wage increase has also been granted to the Sera Je kitchen staff. The kitchen staff work incredibly hard for the Sera Je Food Fund; monks can be expected to work from 4 a.m. to 9 p.m. on a rotating basis. This increase in salary will help increase staff morale with the hope that this will encourage experienced kitchen staff to stay in these jobs for longer periods of time. Having experienced staff is key to maintaining the standard of food served by the kitchen. Please rejoice in the ongoing improvements to the operations of the Sera Je Food Fund which, for twenty-five years, has been offering meals to the monks studying at Sera Je Monastery. 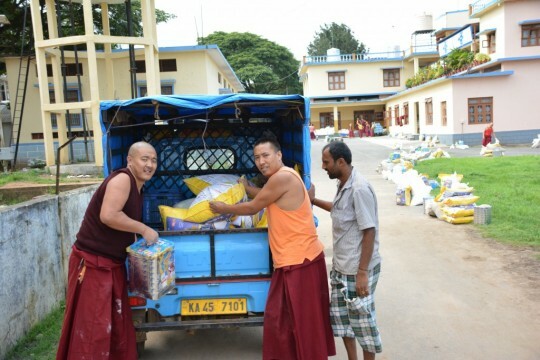 Every day, an incredible effort from many individuals, and a large quantity of food and supplies is needed to prepare, cook, and serve three meals per day to all of the monks studying at Sera Je Food Fund. Over the six months, the Sera Je Food Fund has used 52,254 pounds of flour, 39,062 pounds of rice, and large quantities of other foods such as vegetables, fruits, spices, grains, tea, milk, and other ingredients. Many volunteers offer their time to make sure the meals are prepared, cooked and served three times per day. The cost for offering food through the Sera Je Food Fund, including all the operating costs, supplies, maintenance, and utilities is US$280,000 a year. In six months, US$90,908.09 was spent on food alone. Recently, a short film on the Sera Je Food Fund featuring Lama Zopa Rinpoche was released. In this video Rinpoche candidly speaks on the importance of supporting the food fund and the role it plays in spreading the Dharma in our world. Scenes from daily life at the monastery, including the logistics of preparing meals for all 2,500 resident monks at a time. The Sera Je Food Fund is approaching its 25th year, and the support it’s received and the impact the fund has on the quality of life at Sera Je monastery deserves rejoicing and tremendous thanks for all involved. You can sponsor meals for the monks of Sera Je Monastery as well as keep up on news and updates for this project. A beautiful new short film on the Sera Je Food Fund featuring Lama Zopa Rinpoche was released last week. In it Rinpoche candidly speaks on the importance of supporting the food fund and the role it plays in spreading the Dharma in our world. Scenes from daily life at the vibrant monastery, including what it takes to prepare meals for all 2,500 resident monks at a time, weave through the interview with Rinpoche. The Sera Je Food Fund is approaching its 25th year, and the support it’s received and the impact the fund has on the quality of life at Sera Je monastery deserves endless rejoicing and thanks for all involved. Before the food fund was created, the monastery was struggling to provide nourishment for all of the monks. Now with everyone’s support, the food fund offers every single monk three healthy vegetarian meals a day, everyday, totaling over 3 million meals per year. Please take a moment to rejoice in all the generosity and hard work of all who have supported the Sera Je Food Fund over nearly 25 years, and how it’s helping Sera Monastery cultivate our future teachers and preserve the Buddhadharma. If you would like to get involved and offer meals so the monks can excel in their studies, visit the Sera Je Food Fund’s homepage today. Many thanks go out also to Matteo Passigato who so kindly filmed and edited the video, and to Lara Gatto for all her kind help. 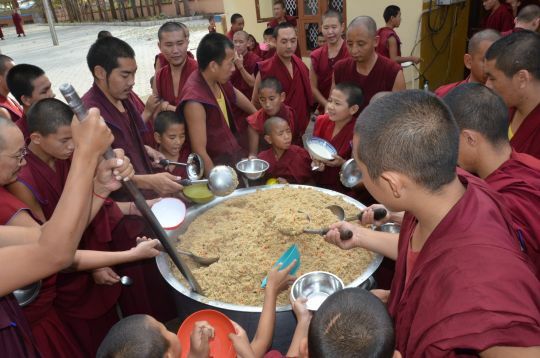 Through the Sera Je Food Fund, 8,300 meals are offered every day to the monks of Sera Je Monastery. 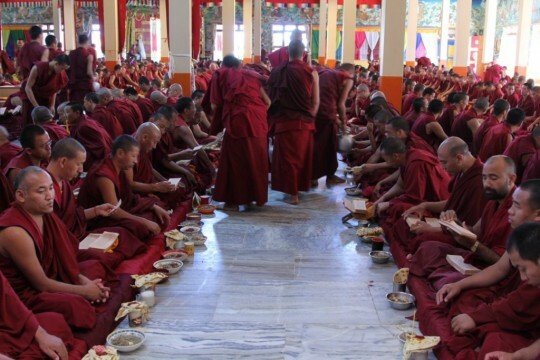 The Sera Je Food Fund offers three meals, daily, to all of the monks studying at Sera Je Monastery. Over three million meals are offered every year, a massive and collective effort of many volunteers at the monastery (who shop for, prepare, and clean up after each meal) as well as many kind donors who contribute to this fund. Lama Zopa Rinpoche started this project in 1991 and has committed to making this offering every day, every year, for as long as possible. Please rejoice that another year of food for this project has been successfully sponsored. Funds offered, together with local interest earned, is used to sponsor food for the entire year. Many volunteers at the monastery shop for food, prepare meals, and clean up after each meal. This is a huge collective effort which must happen every single day. Please read about the benefits of the Sera Je Food Fund and the benefits of making offerings to the Sangha by Lama Zopa Rinpoche. 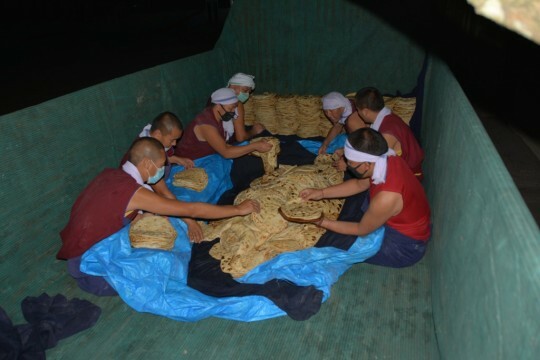 Cooking and food staples, such as flour, were offered to 2,973 monks at Sera Je Monastery over the Summer break. The Sera Je Food Fund is responsible for offering three nutritious meals to all the monks studying at Sera Je Monastery. As the monastery closes for the Summer (and thus, the kitchen closes), the fund makes other arrangements so the monks at the monastery have meals while the monastery is on break. 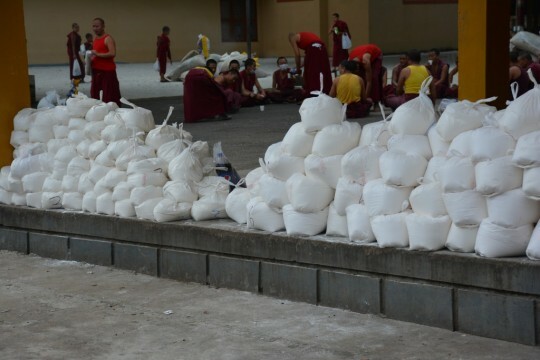 Basic dry food staples are distributed to 2,973 monks ensuring they are able to provide meals for themselves until the monastery and kitchen are back in full operation. Without support from the Sera Je Food Fund, the monks of Sera Je Monastery would have to struggle to adequately feed themselves when the monastery closes for Summer break. All of this is possible due to the kindness of many donors contributing in large and small ways. If you would like to get involved, to help ensure that the monks of Sera Je Monastery are offered food long into the future, you are welcome to contribute any amount to the Sera Je Food Fund. The monks of Sera Je Monastery are offered three nutritious meals every single day through the Sera Je Food Fund. Since 1991, the Sera Je Food Fund has offered meals to the monks studying at Sera Je Monastery in southern India. Today, the fund sponsors 8,300 meals every single day for all 2,500 Sera Je Monastery monks (3,300 monks are served breakfast). This offering allows the monks to concentrate on their studies without the constant worry of sourcing and preparing their next meal. This hour-long video shows the Sera Je Monks practicing in retreat and offering puja, engaging with the local community, and toward the end (45 mins 22 seconds) we see a behind-the-scenes look at the food fund’s operation in action. Please enjoy this short video of the monks sharing one of these meals together. It takes a tremendous amount of food and collective work to offer 8,300 meals every day to the monks of Sera Je Monastery. Every day of every year the Sera Je Food Fund offers breakfast, lunch, and dinner to 2,500 monks studying at the Sera Je Monastery. 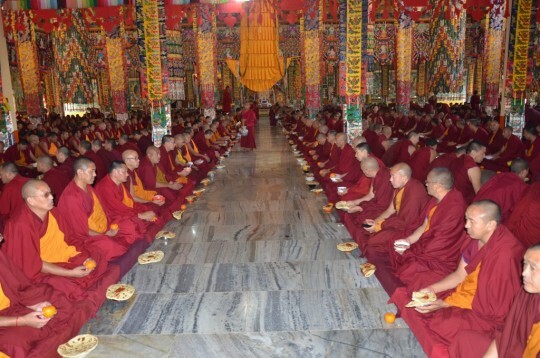 An additional 800 monks join for breakfast every day. Offering this requires a tremendous amount of food and collective dedicated effort. For example, in addition to many other ingredients, approximately 65,900 pounds of rice are needed for daily lunches and dinners and 1,300 pounds of tea are required for breakfast for one year. Over the Winter, the food fund increased the normal offerings by approximately 25% for lunch and 50% for dinner due to the Winter Debate held at Sera Je and attended by the best Buddhist scholars of the great monasteries. 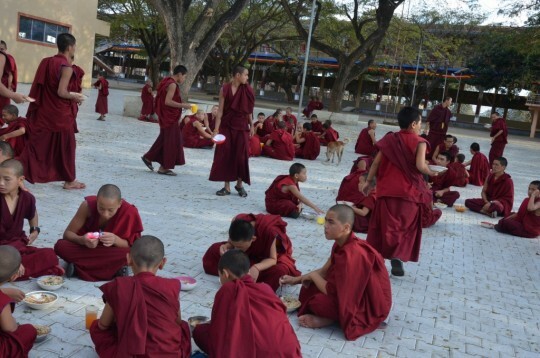 During this time the Sera Je Food Fund provided food for over 1,000 monks. This was also a time for school holidays for Sera Je School and most of the 800 young school monks also joined for meals. 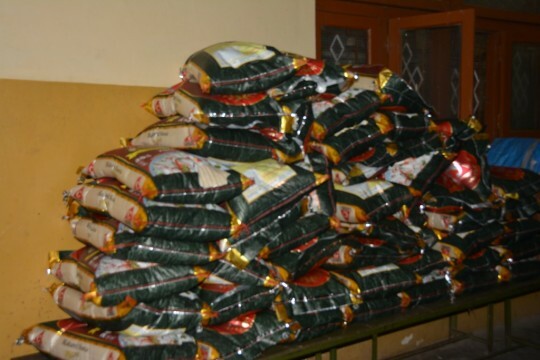 The main additional expenses incurred by the food fund over the month of February was the dried food which is distributed to 2,610 monks for 12 days over the Losar holiday. Expenses of US$916 were also needed over February to renovate and repair the cold storage room in the food fund’s kitchen. Sera Je monks help prepare meals for 2,500 in the Sera Je Food Fund kitchen. Offering food to the monks of Sera Je Monastery, and others during special events, is possible due to the kindness and generosity of many. If you would like to contribute to to this daily offering of 8,300 meals, you are welcome to offer any amount to the Sera Je Food Fund. Death could come any minute so transform your life into Dharma.